Spring 1999. A crystal clear morning, perfect! In this picture you want to look carefully at the wispy "fog" near the summit. Upper Avalanche Gulch the Heart, the Red Banks. This is the view from Lake Helen. To get here on this day we battled fierce headwinds and windblown ice that stings the skin. We sit in a tent site depression in the snow, with our backs to the wind. Thinking. 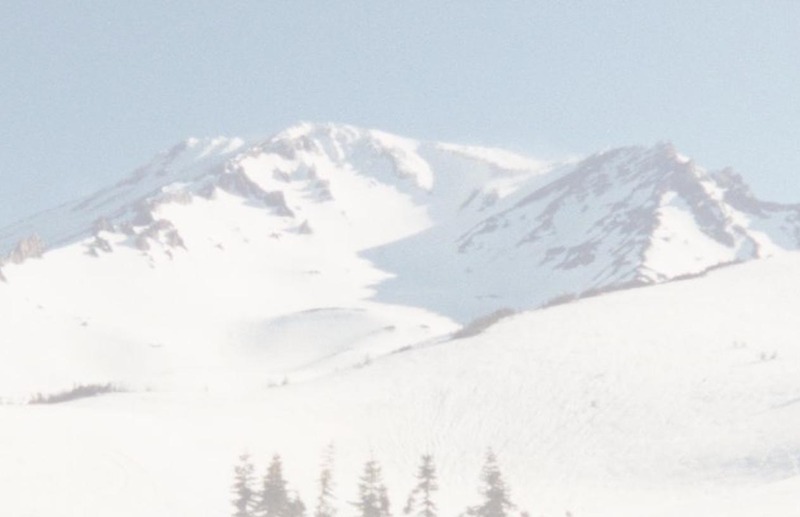 Look for the skier that just decended, he is at the bottom edge of the picture. Reports from the upper elevations are all bad. "High winds and rocks falling". We turned around here. Upper Avalanche Gulch 7 days later. A serious case of regret sank in after the first attempt. I wondered over and over, 'Did I wimp out?'. So we returned to the mountain that defeated us. It's seven days later. A hiker has been missing since last week. The dark smudges and dots on the once pristine snow are gravel and rocks blown off the upper mountain. Reports from the upper mountain are again bad. "Bad visibility, its socked in up there." But we are not to be denied this time! We ignore the negative comments and proceed. "Look at the size of those rocks. How could the wind blow that down?" Red Banks. The sky was clear for just a moment. Notice the crampons are not being used. Top of Misery Hill. The top of aptly named Misery Hill rewards us with a view of the summit. The summit is out of view most of the time up until now. Me at the top. Nine hours to hike up, but fatigue magically washes away. That box sitting next to me is heavy and bolted to the rock. It contains a book to sign in, and some "momentos". Partner on top. Look for the prayer flag draped on the summit rock. Also notice the sky behind. There was a light breeze and clouds that blocked out what must certainly be some spectacular vistas. Oh well, next time. After a nice well deserved summit meal/break, we descend. The descent takes 90 minutes.